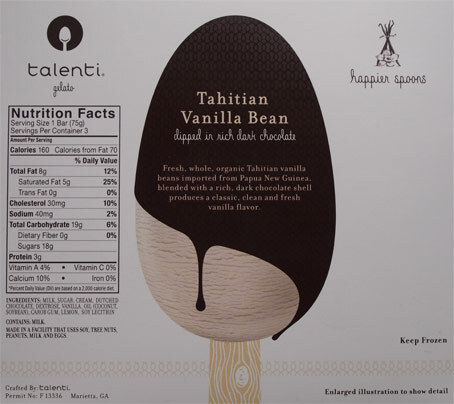 [New for 2013, discontinued product line] So Talenti, the biggest gelato maker in the country (and the number three premium brand), has decided to jump into the frozen treat market. Everyone else has done it, like say Ciao Bella, so why shouldn't they? It only seems fair that they bring their expertise to a lineup that includes *8* new flavors of gelato pops. 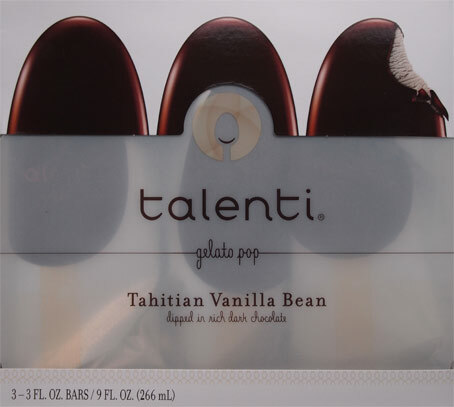 Now Talenti sent over three samples, but I gotta go with the Tahitian Vanilla Bean gelato pop first. It's their Tahitian vanilla bean gelato dipped in rich dark chocolate. Oh, you know I love dark chocolate, and check out how fancy this packaging is. That's a transparent white plastic window so you can see the three pops hiding inside. Now the shell is a little cracked in this first photo, but that's just a transport issue, the others were fine. Oh the anticipation. I haven't tried Talenti's Vanilla Bean ice cream yet and now here it is before me enrobed in chocolate. Oh I can barely contain myself! I take my first taste and wow, this is some really nice chocolate. It kind of reminds me of eating toll house morsels at first. 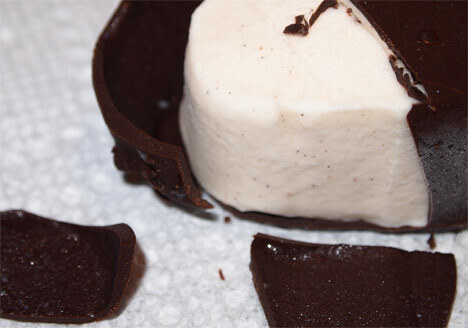 The shell is neither too thick or too thin, and it just melts in your mouth. The shell is excellent, really distracting, but I can actually taste the gelato too! I actually taste the vanilla in a vanilla pop! It's a miracle! Wow, I knew Talenti wouldn't mess around and they haven't. They have created some very serious competition for Magnum. Yes this bar feels smaller than magnum, but it's really only a 10 gram difference, plus it has way less total fat and saturated fat. I'm really tempted to eat two right now. On Second Scoop: Ok, I went all of four hours before trying another pop. Now I always feel a little guilty cutting up a quality product like this, but you really need to see the construction on this one. Check out the thickness of the shell, check out the flecks of vanilla bean, plus, there's an upside to this carnage. I tasted a piece of chocolate shell and confirmed that this dark chocolate wonder literally just melts on your tongue. It's dark, but not dry against the wonderful gelato inside. Magnum's double chocolate shell is a wonder in itself, but this bar is arguably better. Talenti never messes around, yet still I am shocked at how good this is. Wow, just wow. Can NOT wait to try these bars! Do you think this ice cream is lighter in weight because of the fact it's gelato?